It’s all come down to this. 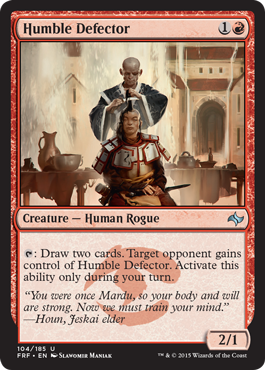 Red is going to be the make or break color for Jeskai, Mardu, and Temur strategies. Red is the color of burn and flying dragons. In Khans of Tarkir we had the mighty Sarkhan, and more than a handful of burn spells such as Arc Lightning and Crater’s Claws. The color was always on the verge of breaking out in Khans of Tarkir limited, but was overshadowed by Mardu’s black and white Warriors and Temur’s green beasts. 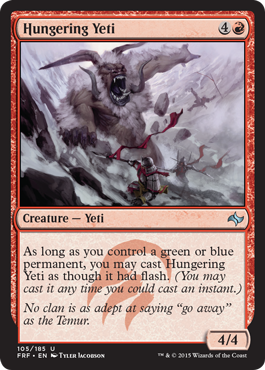 So what does red bring to the table in Fate Reforged? Well, there are a decent amount of creatures which means that Mardu and Temur should still have a lot of choices when it comes to building your deck in those colors, but I feel like in return we had to sacrifice any decent burn spells. 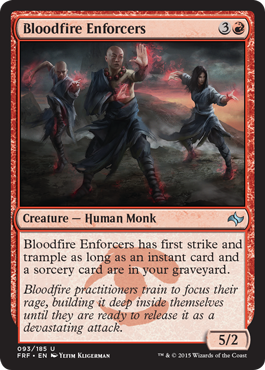 In a Jeskai Prowess deck, Bloodfire Enforcers shouldn’t have a problem activating their second ability. A 5/2 creature for 4 mana is a good way to fill out your curve in a quick Jeskai build, and there are plenty of playable white and blue instants and sorceries to help use. Jeskai always struggled with finishers in KTK limited, but I think the Enforcers can do a good job of finishing games from time to time. Although it looks like a glass cannon that would die to any attack, you could very easily trick your opponent by playing an instant to suddenly turn on it’s first strike. Not a high pick, but something I probably wouldn’t cut out of my sealed pool. 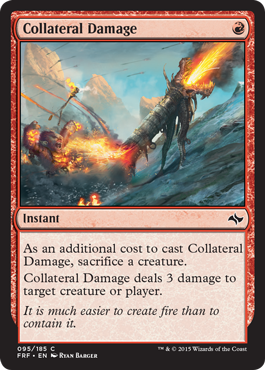 Collateral Damage is the closest thing we’re going to get to Lightning Bolt in standard. Well, it’s actually closer to Shard Volley (which I would have preferred they reprinted instead). Having to sacrifice a creature for 3 damage isn’t that good of a trade off in limited. Every creature counts, and unless you’re throwing away a creature that was going to die anyways (such as a token or after a chump block), you’re going to be in the hole after using this card. It’s not bad, I mean come on, it’s 3 damage for 1 mana . . . the problem is you have to sacrifice a creature. If you’ve fallen behind later in the game, this isn’t something you want to be drawing. I do think it could do well with fast Jeskai and Mardu decks, especially if you have a Monastery Mentor, but be careful in what type of deck you use it in. Here’s another card that will do well in an aggressive Mardu/Jeskai deck. His stats are decent, and a 3/2 with haste for 3 is good too when you play it early. The Heelcutter will be able to sneak in some damage for you no matter how you “cut it” (^_^). His ability gets better the faster you can deal damage. Your opponent will be forced to block unfavorably a few times, and he’ll slowly but surely push the game in your favor. This card is set to blow up in standard alongside Jeskai Ascendancy, but it should be pretty good in limited as well. This is the best red card advantage I’ve seen in a long time. Usually you have to discard your hand to get anything new, but the Defector lets you tap him and get 2 cards. I believe you can put his ability on the stack and use something like Collateral Damage to draw 2 cards and deal 3 damage for a measly 3 mana. Value. He fits well on your curve, gives you a good body, and gives you cards. What’s not to like? I’ve noticed that there are a lot more 4 power creatures overall in KTK/FRF limited now, and that means you can activate all those Ferocious triggers a lot easier. Temur is a decent clan to play with, but even if you don’t play with green or blue a 4/4 creature for 5 is still good. Giving him flash turns him into a combat trick to block your opponent’s creatures, and also makes it hard for them to plan their attacks/defense if they have to worry about him getting flashed in at the end of their turn. I would consider him a solid choice in a Jeskai in Mardu, and a must play if you’re playing Temur. 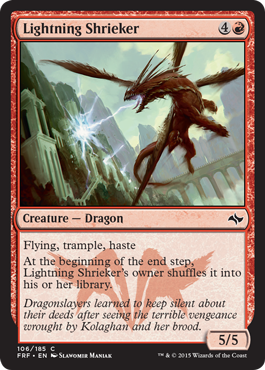 Lightning Shrieker is a welcomed upgrade over Archwing Dragon from Avacyn Restored. For an extra mana, you get one more power and trample. Not only does it give most of the other dragons headaches, it’s also a common. Of course his drawback is that you have to shuffle it into his owners library, but you can consider it as a reusable 5 damage spell of sorts. 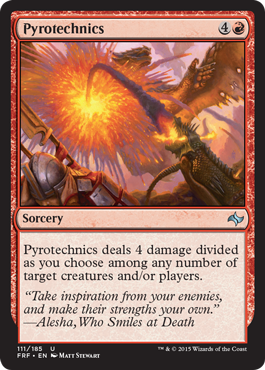 It’s a great card to use when you have any of the rare dragons in play so you can spread the effects between them. I personally got to play Atarka (double strike) and Silumgar (-1/-1) with him and found the Shrieker extremely effective as a finisher. Just remember that he’s purely offensive. There will be no blocking for him. Pyrotechnics is somewhat pricey at 5 mana, but with all the Manifest effects you’re going to see, I think you’ll be willing to pay that so you can take out 2 morphed/manifested creatures. I believe that removal is going to be at a premium in this limited format, and you can count on this card to take out almost anything including the uncommon 4/4 dragons. Geezus, red sure got some angry dragons on their side. 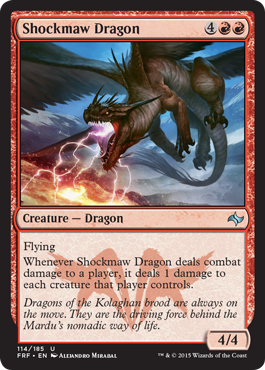 Shockmaw Dragon must be the ancestor of Thundermaw Hellkite (M13). His effect isn’t as good as his descendants, but it’s pretty good for an uncommon. You’d be surprised at what 1 damage can accomplish against your opponent’s creatures. Played in conjunction with Silumgar, the Drifting Death or a simple Barrage of Boulders, you can wipe out all of their morphed creatures, and take care of most tokens. Good card overall I think, especially if you can deal with their dragon so they don’t impede your attacks. Four power to attack with on turn 3 is pretty good, and after playing with it in the pre-release I can say I used his ability a lot more than I thought. I wasn’t playing that many cards that gave me card advantage (such as manifest cards), so when I started to mana flood, I was really grateful to have a way to dump the extra cards for something useful. I definitely recommend using him in Mardu decks to give you better card selection, and he should be a great fit in Temur or Jeskai too. 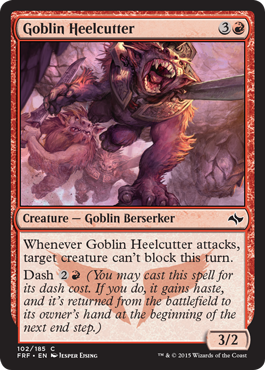 Rageform – 4 mana for a 2/2 double striker isn’t bad, and it gets even better when you flip it to reveal an even more powerful creature. Mardu Scout – Great for aggressive Mardu aggro and Jeskai tempo decks. Wild Slash – Sure, I’ll take a Shock early in the game against a battlefield full of 2/2 morphs! 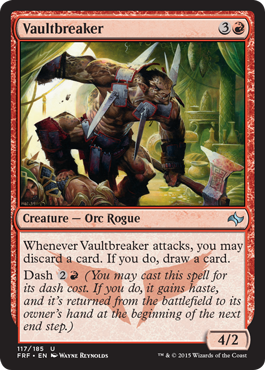 Dash is a great new tool for Mardu, and all these new flying Dragons give Temur and Jeskai some real power in the air. Some of the cards like Flamerush Rider can get really out of hand and end games out of nowhere if you’re not careful. Red is back to doing what it knows best, hitting hard and hitting fast. I’ll be covering green next, so be sure to check back by Sunday to see what monsters will be finding their way into your limited decks!